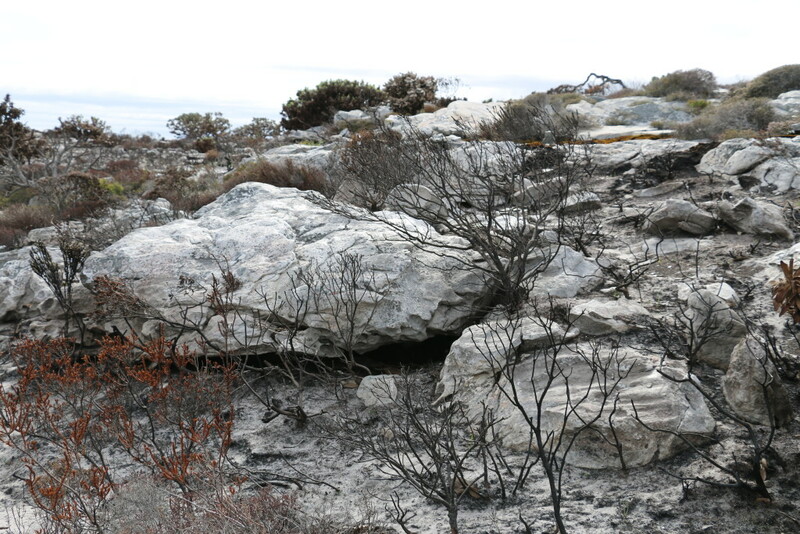 One of the major influences on the formation and maintenance of the fynbos biome is the periodic occurrence of fires which are regarded as necessary at intervals of every 15 years or so. Fynbos fires can be extremely hot if there is accumulated fuel and a wind driving the fire. 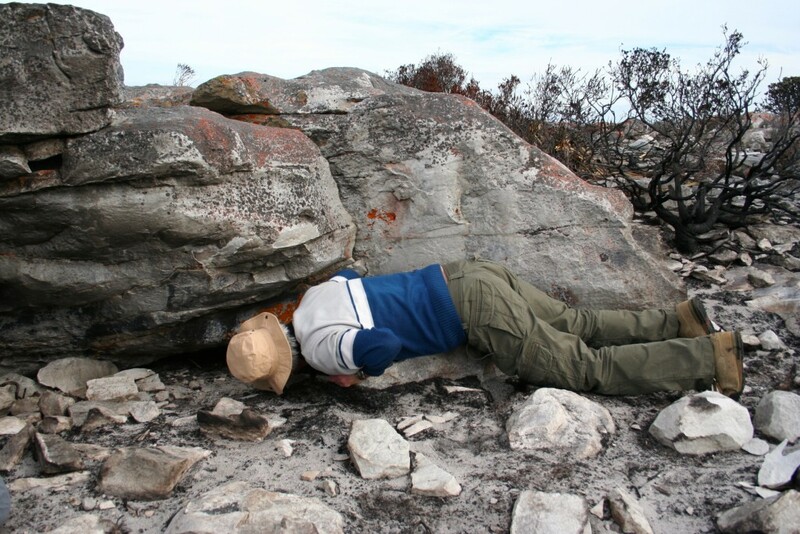 Fynbos plants are adapted to fire and respond in various ways including serotiny where fire releases the seeds of various Proteaceae from their fire-resistant seed-capsules after the fire has passed. In response to the smoke these seeds which are stimulated by cooler tempertaures and rain germinate. 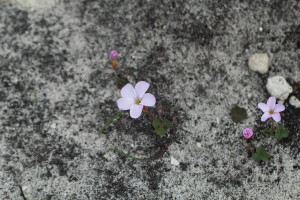 Other plants may survive as underground bulbs or tubers and take the opportunity of the post-fire period of reduced competition to proliferate, with different species appearing on the surface and flowering in sequential waves. Figure 1. 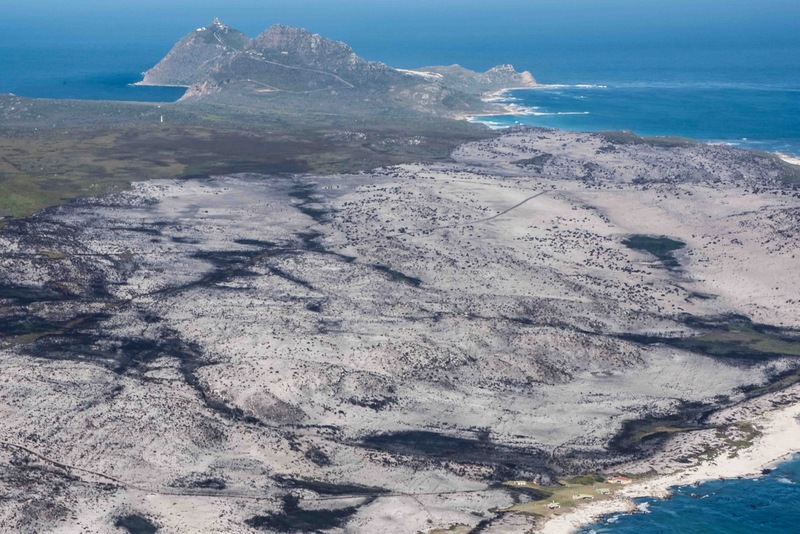 Aerial view of the swathe of destruction the fire caused in the Cape Point section of Table Mountain National Park in March 2015 (courtesy of Dr Jonathan Ball). Cape bee nesting sites. The natural distribution of the Cape honeybee (Apis mellifera capensis Escholtz) is extremely limited and closely follows that of the fynbos vegetation of the winter rainfall region (originally covering only 90 000 km²). The Cape honeybee co-evolved with the fynbos and is well adapted to its environment. 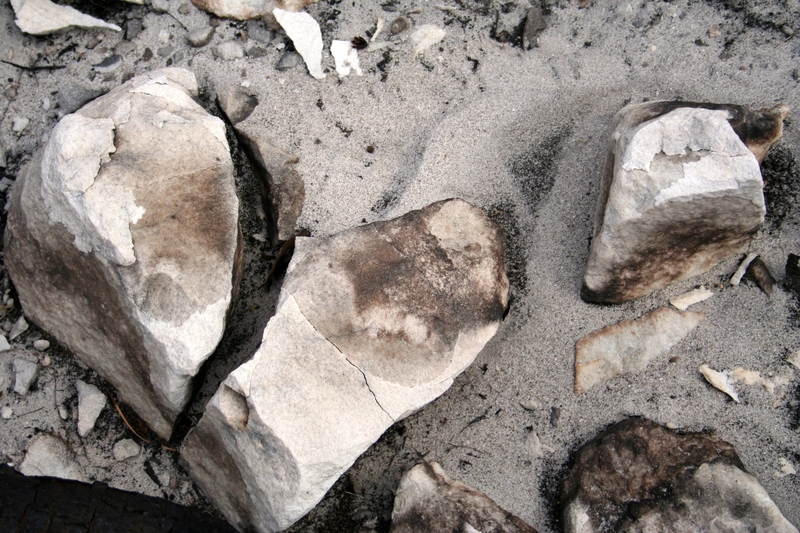 The wild fire following a lightning strike on 5 March 2015 which cut through a section of Cape Point Nature Reserve before it was extinguished (Fig.1) left a desolation of ash and sand in its wake (Fig. 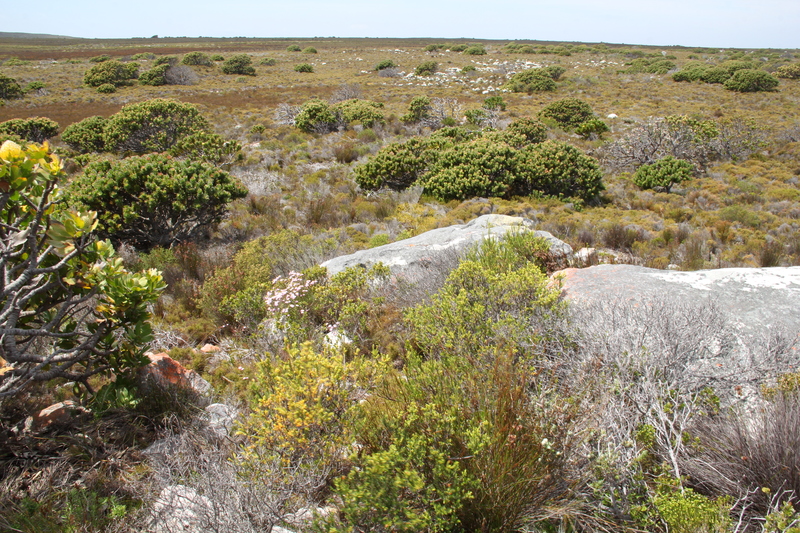 2).The adaptation of various creatures to fire-prone fynbos gives some insight into the importance in the selection of nesting sites within the fynbos by honeybees. Within this swathe were three natural colonies which had been monitored for nine months prior to the fire. The colonies were between 1 and 2.5kms apart. Figure 2. 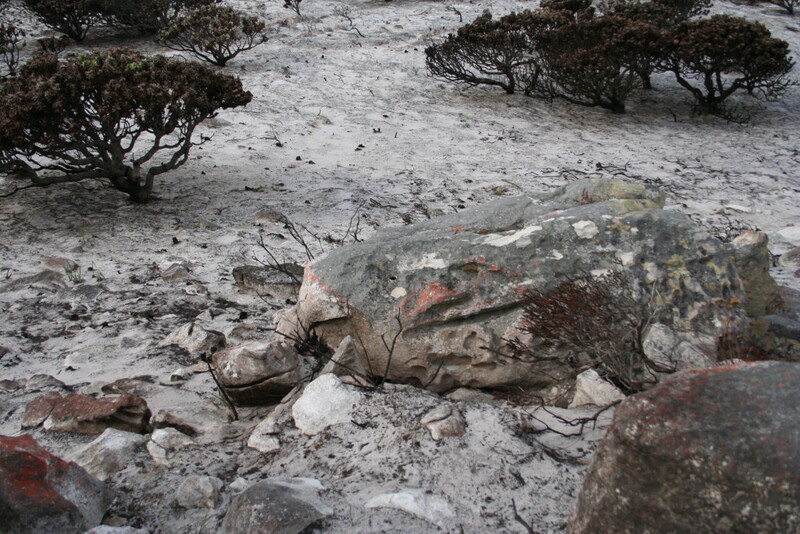 The aftermath: ash, sand and blackened skeletons of shrubs. The colonies in the burnt area were visited on 15 May 2015. All three colonies escaped initial destruction by the fire and this was primarily due to where they had established their nests – under boulders at ground level. But none of the colonies escaped totally unscathed and all had declined in vigour and in the number of active foragers. The highest yearly annual wind speed in southern Africa is recorded at Cape Point and, in addition, the now loose sand is being blown into the fully exposed nests which is exacerbating their efforts to survive. The winter rains are delayed and severe downpours could result when they do arrive which could flood the nests with sludge. The nest of Colony 1 which was constructed deep under a boulder (Fig. 3a) appeared to have escaped relatively unscathed due to the propolis wall which protected the nest but had melted due to the heat from the fire (Fig. 3b). Fourteen combs were visible but the population had dwindled considerably although there was foraging activity with pollen from Serruria sp. growing outside the burnt area being brought back to the nest. Prior to the fire, Colony 1 was fairly protected from the elements by the growth of vegetation around it (Fig. 3c). Fig. 3a. Colony 1 whose nest under the boulder (the dark area at ground level in the centre) was protected by a propolis wall escaped destruction. Fig. 3c. Colony 1 prior to the fire protected from the elements by the growth of vegetation around it. Fig. 3b. 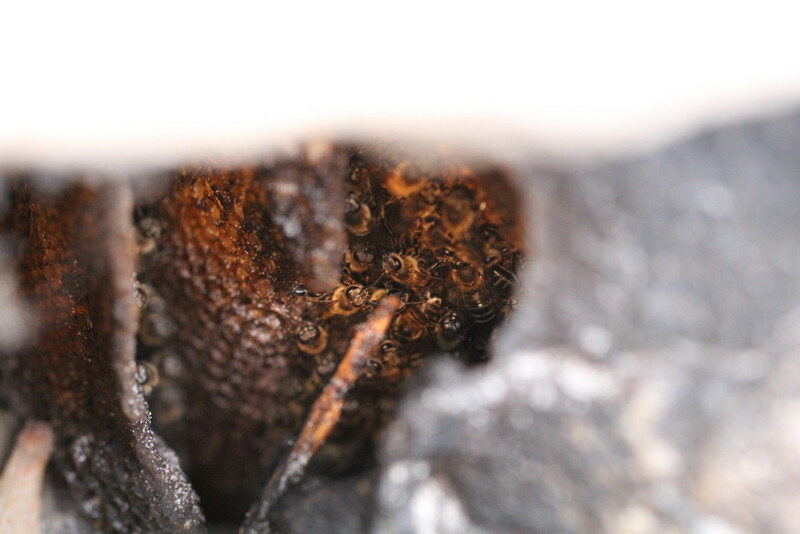 The nest of Colony 1 whose 14 combs had been protected from the fire by a propolis wall that covered the cavity. The nest of colony 1 prior to the fire. Colony 2 (Fig. 4a) appeared to have been severely affected by the fire, which judging from the numerous rocks about the entrance that were cracked (Fig. 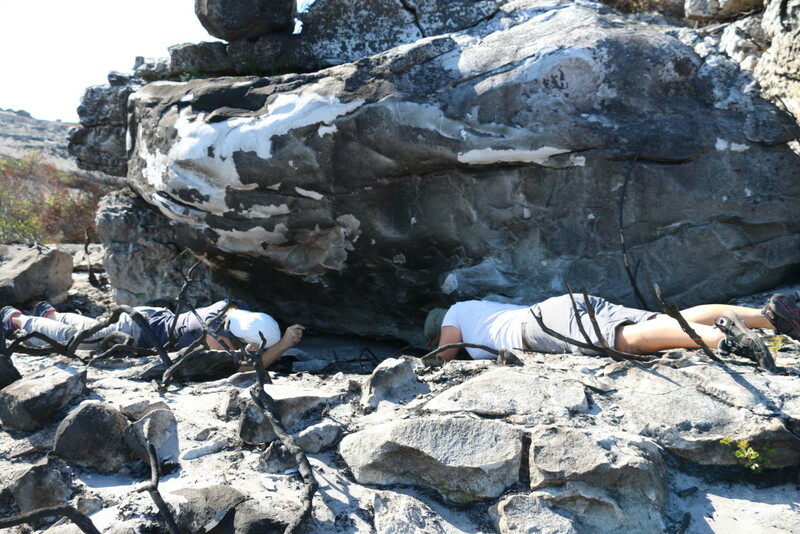 4b), the heat was intense. The propolis wall had melted and the combs had melted except for the comb mid-rib (Fig. 4c). During the examination of the colony in cold windy weather, two bees emerged but were unable to depart normally on flights as if both were too cold and starved to do so. However, on the following sunny day foraging activity was witnessed (Fig. 4d). Fig. 4a. Colony 2 is located to the right side of the foremost boulder below where the orange lichens start. Colony 2 prior to the fire. 4b. 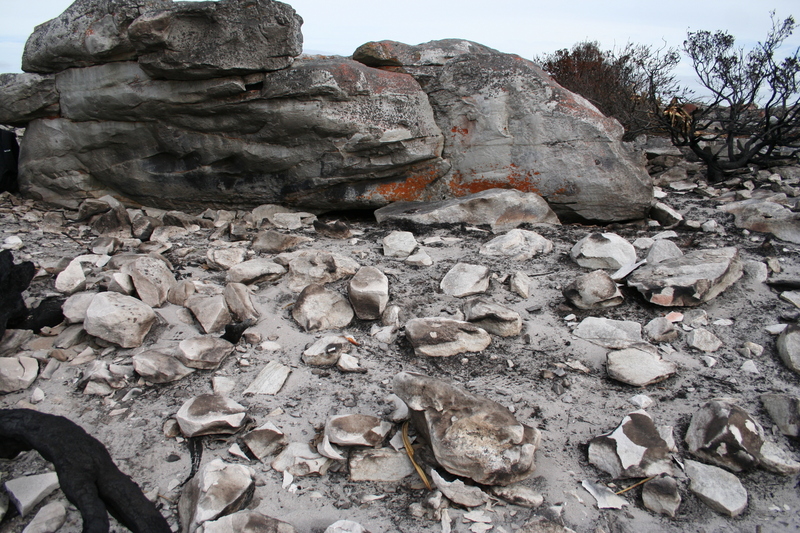 Rocks around the entrance to the nest cracked from the heat of the fire. Fig. 4c. The almost deserted combs of Colony 2. Fig. 4d. Foraging activity at Colony 2. From inspection, Colony 3 (Fig. 5a) had a propolis wall which enclosed the entire nest but which was melted by the fire – as had some of the combs which consisted only of the comb mid-rib (Fig. 5b). 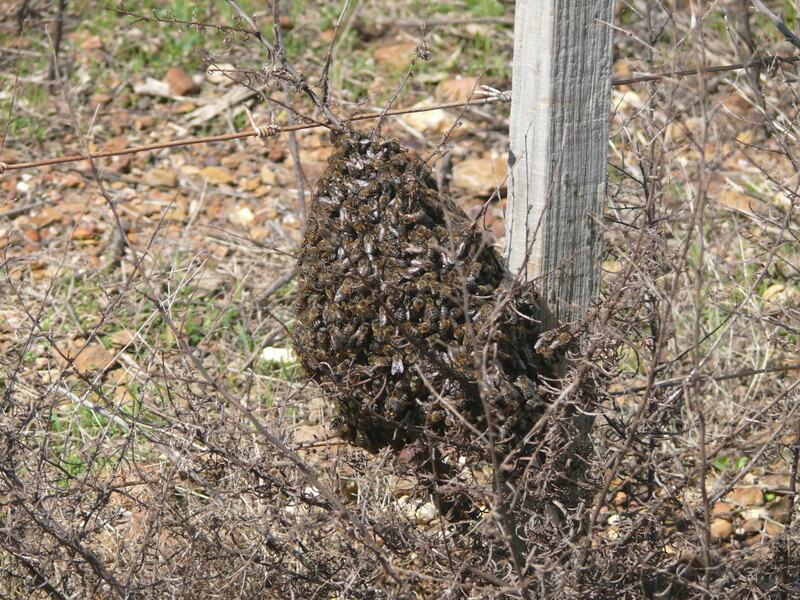 On a subsequent visit, of the seven combs that were visible, the bees were clustered on the end three combs but were still actively foraging (Fig. 5c). Figure 5a. The entrance to Colony 3 lies under the boulder with a seemingly horizontal crack in it and to the right of the reddish, lichen covered rocks (situated bottom left corner in the picture). Colony 3 prior to the fire. Fig. 5b. Bees of Colony 3 clustered on some melted combs. Note the remains of the melted propolis that once encased the nest entrance. Fig. 5c. Bees of Colony 3 clustered on some combs while the others are deserted. Propolis and beeswax: It has been recorded that during the heat from a fire, bees keep the colony ventilated by vigorously fanning their wings to prevent the combs from melting (Root 1950). At temperatures of 25-45°C propolis is soft and pliable and most varieties will melt between 60-70°C and some only at 100°C. Beeswax melts at about 63°C. Honeybees maintain a hive temperature of 34°C within the brood area. 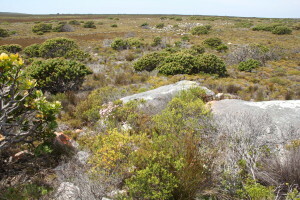 Propolis is a mixture of different plant resins and gums collected from unopened flower buds, especially of Leucospermum and Protea species within Cape Point. Because it consists of the defensive chemical exudates of plants, it has many anti-bacterial and anti-fungal properties and is aromatic. The major components of propolis are resins (45-55%); waxes and fatty acids from both beeswax and plants (25-35%); essential oils (10%); protein – mainly pollen (5%); and trace elements – mainly iron and zinc (5%). Propolis used within the hive may have beeswax added to it to be more pliable but can also consist of pure plant exudates in outer structures. Its thickness depends on the purpose of the structure under construction. In the case of the colony which survived the fire, the propolis wall (pro = before; polis = the city) built at right angles to the combs, did indeed protect the nest. It appears that the main function of the propolis barrier was the exclusion of rain and cold. Propolis has many uses in that it can be used to control ventilation, waterproof the interior of a nest, to control temperature and humidity within the nest, and to exclude various pests from entering and hiding within the nest. 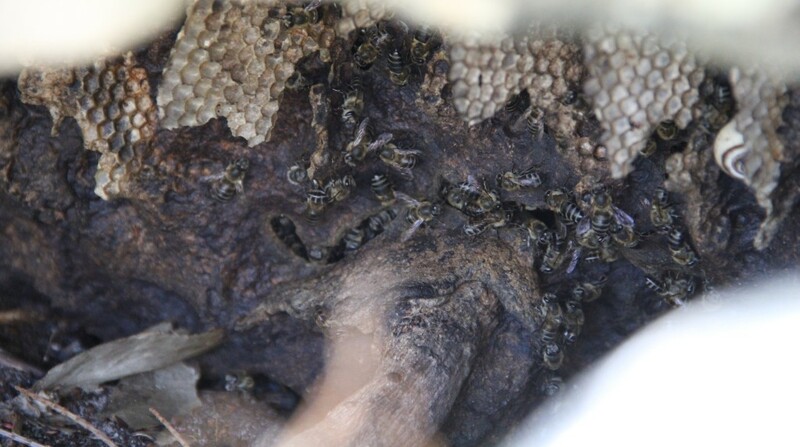 The prolific use of propolis by the African honeybee may also be as a result of attempts to deny hiding places within the hive to the small hive beetle (Aethina tumida) by sealing crevices. Natural nests are often located in cavities which afford many hiding places to the small hive beetle, thus lining the cavity with propolis effectively seals the nest off from its immediate surroundings (Tribe 2000). The extent to which propolis may be used to insulate a nest was illustrated in the complete enclosure of combs hanging from under a branch of a tree in Pretoria, allowing bees to forage from just a few small openings in the propolis sheath (Tribe & Fletcher 1977). 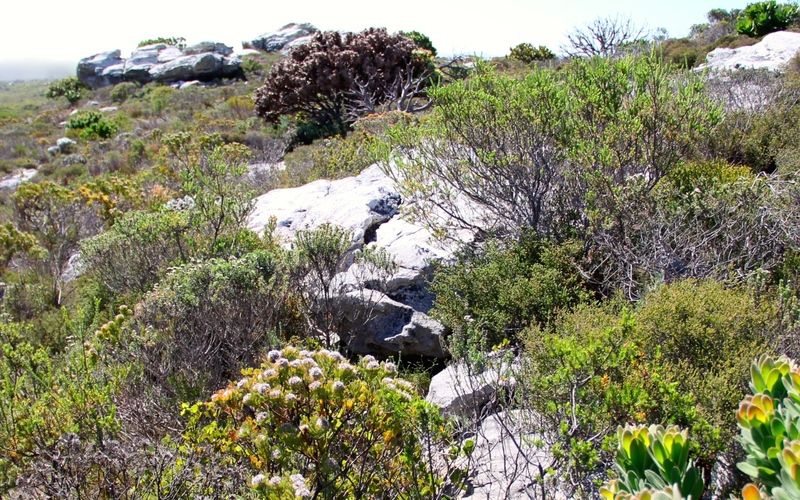 Cape Point Nature Reserve: Unlike the summer rainfall honeybee race (Apis mellifera scutellata) of southern Africa, the Cape bee nests are more often located within shrubbery at ground level. This does not preclude them from constructing nests in elevated places like those for A. m. scutellata. 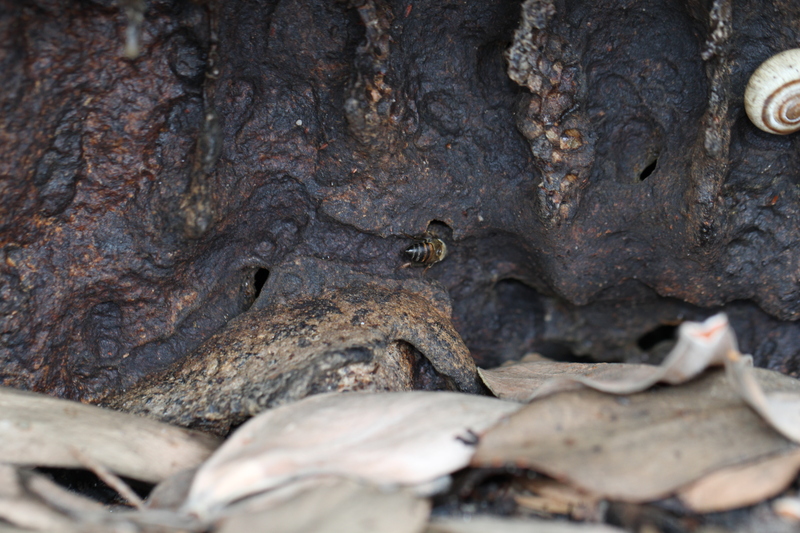 In fact, in suburbs of Cape Town, Cape bee nests have been located several meters high in exotic palm and pine trees. 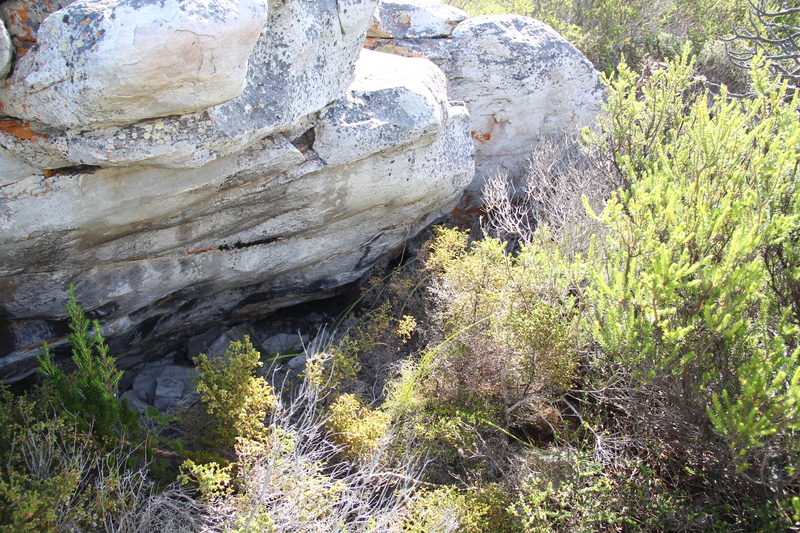 Data on Cape bee nesting sites recorded in Cape Point thus far indicate that about 90% of selected sites are located under or within rock crevices (Fig. 6). Figure 6. 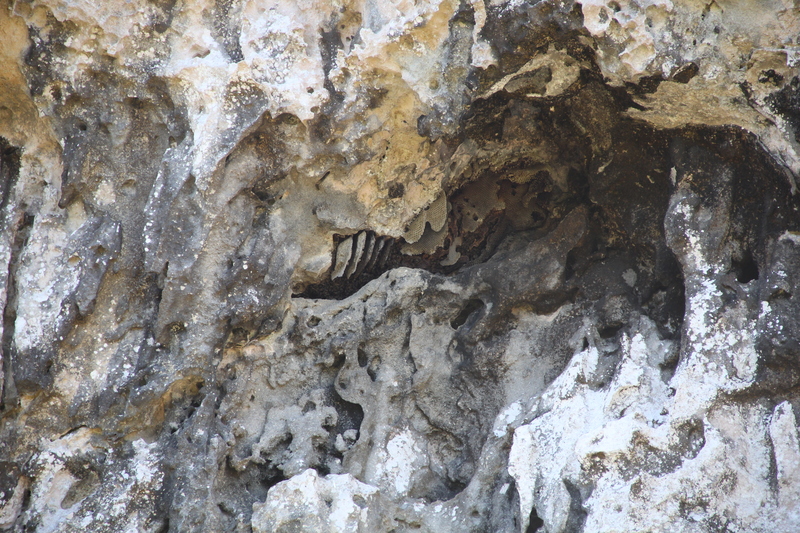 Colony in the cliff face at Cape Point Nature Reserve. 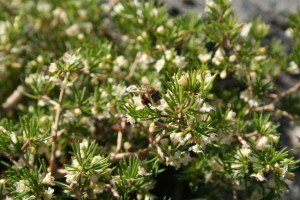 Because honeybees will reoccupy any site previously inhabited by other honeybees, it is likely that many of these sites have been in use for centuries. What was amazing was that bees often issued in a steady stream from a relatively small hole in the soil at the base of a rock at some of these nests. 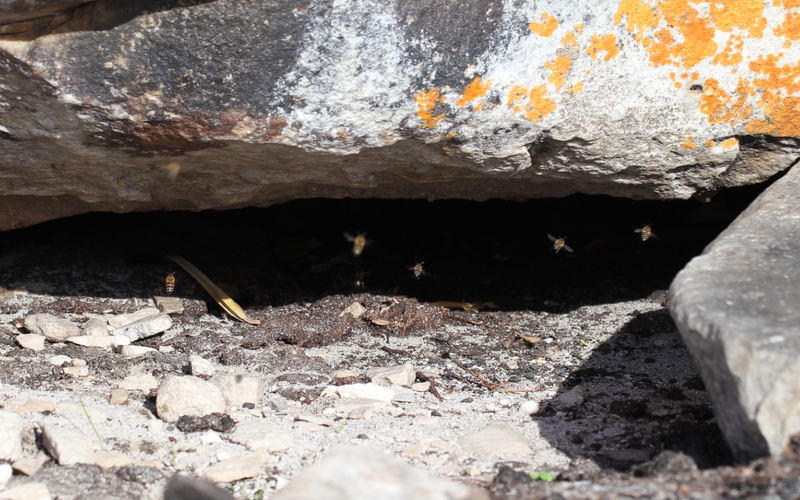 How were these bees able to locate such hidden nesting sites which must occupy a substantial cavity size below the rock of say, about 42 litres – which is the capacity of a Langstroth hive? 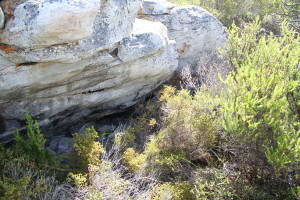 It is probable that such nesting sites were located by scouts in the past when they were more exposed, possibly as a result of a fire followed by winds and then heavy rainfall which revealed the cavity under the rock. With an average fire frequency of 15 years, the debris and plant growth during this time around the site could have closed off most of the cavity, the bees maintaining only the narrowed entrance. Are nesting sites a limiting factor? Is the availability of nesting sites a limiting factor on the number of colonies able to reside in Cape Point? This is difficult to answer without knowing how many reproductive swarms are issued each year from the established swarms. An individual colony may issue none or several reproductive swarms a year (Fig. 7) – largely determined by the capacity to expand within the nesting space (i.e. over-crowding), the strength of the colony (nectar and pollen reserves) and the vigour of the queen. Usually the old queen departs with flight-experienced workers, leaving behind several queen cells from which virgin queens will shortly emerge. If the colony is still over crowded, one or more additional swarms may leave with virgin queens – but this is more common among A. m. scutellata. However, at least one swarm at Cape Point was unable to find a secure nest and built their combs from interlacing branches within a fynbos thicket. Any approach to this nest elicits an immediate hostile reaction, presumably because of the odour of crushed vegetation underfoot. In the event of a fire, this colony would be incinerated. Abscond? What remains to be seen is whether the three colonies which escaped the fire will remain where they are or will abscond. The Cape Point fire was extinguished and foraging still exists outside the burnt swathe, although the foragers will have further to fly. In the past similar wild fires would burn over a vast area, leaving little or no forage for many weeks. 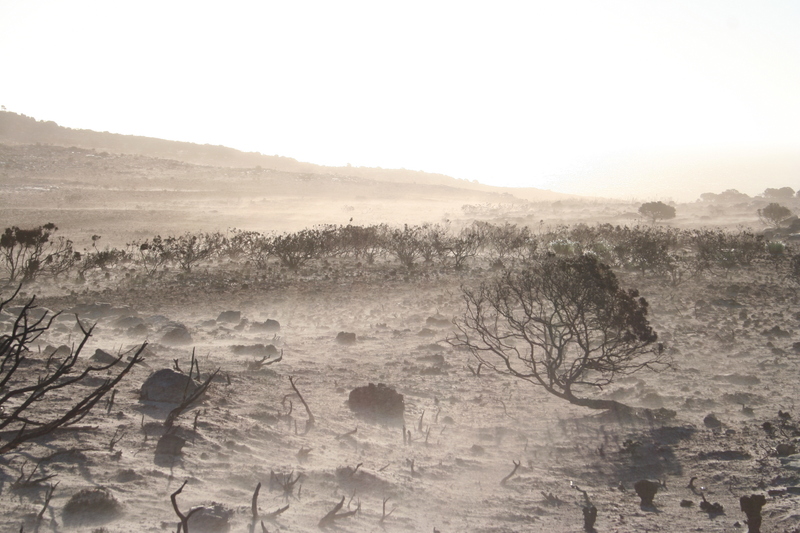 For example, a wild fire in the Cedarberg burnt for six days and covered 13 500ha (Jarman 1982) turning the entire area into a wasteland for bees with no forage. 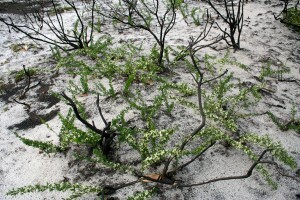 However, the resilience of the fynbos was revealed at Cape Point in the appearance of fire-asparagus (Asparagus lignosus) shortly after the fire which began flowering within weeks – to the benefit of the numerous bees visiting it. 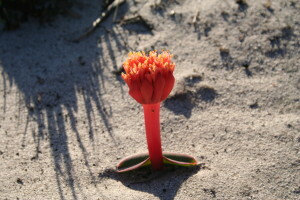 Also emerged in response to the fire were Haemanthus sanguineus and a smattering of plants such as Oxalis which were also visited by foragers. Honeybee predators: Cape Point Nature Reserve no longer has honey badgers (Mellivora capensis) which possibly occurred there in the past, thereby eliminating one of the honeybees’ most destructive enemies. Had they been present, there would be the annihilation of those colonies accessible to them, followed by the later re-establishment by reproductive swarms from other areas within the park – thus creating an on-going dynamic. Although baboons also readily raid honeybee nests and are prevalent in the reserve, none of the 31 colonies has thus far been raided by baboons. Jarman, M. 1982. A look at the littlest floral kingdom. Scientiae 23(3): 9-19. Johannsmeier, M.F. (Ed.). 2001. Beekeeping in South Africa. Plant Protection Research Institute Handbook No 14, Agricultural Research Council of South Africa. 228pp. Root, A.I. 1950. The ABC and XYZ of Bee Culture. The A.I. Root Company, Medina, Ohio, U.S.A. 703pp. Tribe, G.D. & Fletcher, D.J.C. 1977. A propolized nest in the open. South African Bee Journal 49(4): 5-7. This entry was posted in Uncategorized on May 31, 2015 by ujubee. Thank you for your wonderful article. I am a complete dunce when it comes to the lives of bees – but they do nevertheless, fascinate and enchant me – especially as I have had some special little experiences in my own Welcome Glen garden. Some years back on a cold misty evening I came across a swarm which had coned and found shelter in my garden for a few days until the weather warmed up; and, I watch with great interest the tunnelling bees who frequent my pots. I planted my indigenous garden for my love of birds, and have been rewarded by many other creatures. Thank you again, it’s wonderful to see how they have managed after the fires – I love following you on Facebook. Most informative. The information about pollen provision by Restionaceae is also very interesting and a very good reason to plant locally indigenous restios in our gardens.